1. The turkey usually produces females for several generations. How it this possible? Ans: It is due to parthenogenesis. 2. The meiocyte of an onion plant contains 32 chromosomes. Workout the number of chromosomes found in its endosperm. 3. The gene I that controls the ABO blood grouping in human beings has three alleles IA, IB and i.
a) How many different genotypes are likely to be present in human population? b) Also, how many phenotypes are possibly present? Ferns, herbaceous lycopods, seed ferns and horse tails. 5. Name the source of smack. Mention one way in which affects the human body. 6. In plants, how is alien DNA introduced into the host cell? Ans: To introduce alien DNA in plants, plant cells are bombarded with high velocity micro particles of gold or tungungsten coated with DNA in a method known as biolistics or gene gun (gene transfer methods). 7. Mr. Galgotia eats curd/ yogurt. IN this case, which trophic level will be occupy? 8. 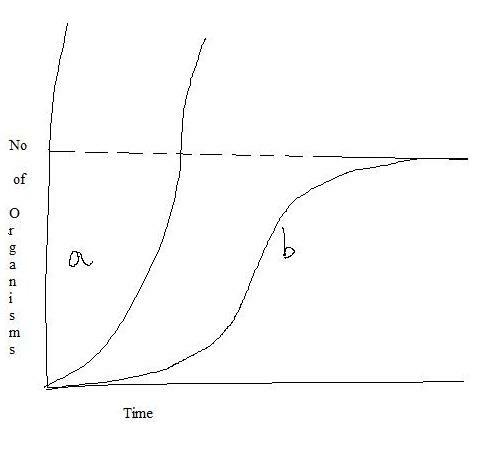 In the absence of the predators, which curve (a) or (b) would appropriately depict the prey populations?